Some of the most famous recruitment posters of the First World War will feature in the first ever Official Imperial War Museums Ingot Set that launches a partnership between The London Mint Office and Imperial War Museums in the centenary of the end of the war. The London Mint Office produces coins, medals and ingots to commemorate world events and historic milestones. IWM (Imperial War Museums) tells the story of people who have lived, fought and died in conflicts involving Britain and the Commonwealth since the First World War. The partnership will help examine the context of these famous First World War recruitment posters through an exclusive set of commemorative ingots available in this centenary year. The emotive propaganda posters were carefully designed to strike a chord with potential conscripts in towns and villages across the land as well as overseas, appealing them to enlist, leave their homes and families, and serve their king and country. Imperial War Museums has selected a number of these iconic posters to be reproduced in full colour on ingots that are to be issued in an exclusive collection by The London Mint Office. Each artist used their own individual approach in mobilising young men and women throughout the length and breadth of the country, sometimes whipping up patriotic fervour, sometimes appealing to their sense of adventure, whilst often reinforcing the social pressures faced in their daily lives. 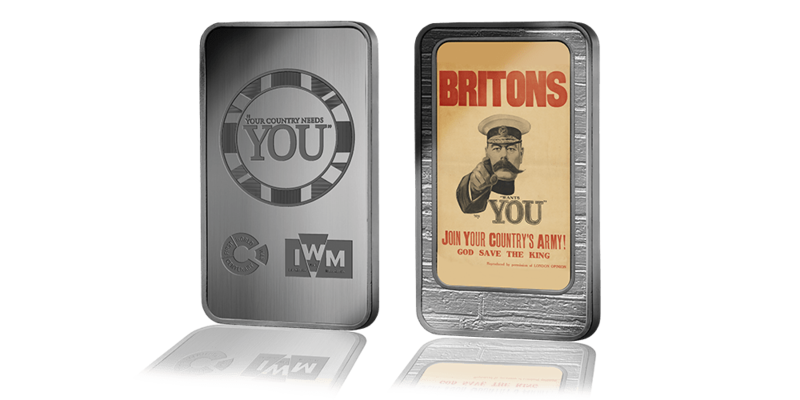 The set begins with the Official Imperial War Museums Silver Layered Ingot featuring the instantly recognisable image of Field Marshal Lord Kitchener. This now infamous image actually started life not as a poster but as the cover of London Opinion magazine in 1914. It was created by professional illustrator Alfred Leete and shows the then Secretary of State for War pointing an accusatory finger at the viewer, directly appealing them to enlist. The image has resonated through the decades, and is even used in US recruitment drives today.